To maximize net proceeds. Length of time on the market was not important. 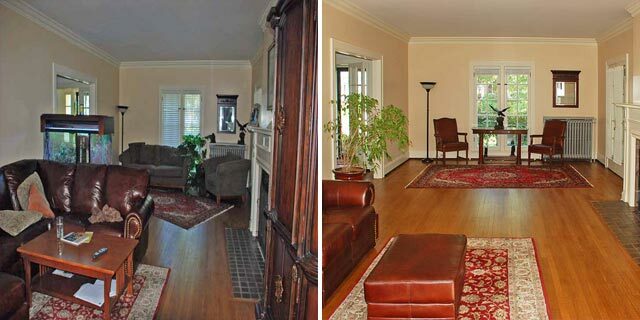 Seller had a stately, but dated home with too much furniture and little organization. 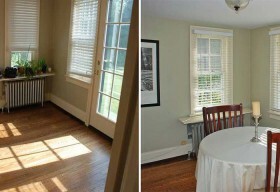 Old kitchen, old baths, worn hardwood floors. 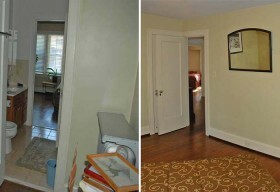 Dated, clutter homes in Cleveland Heights in general were not selling. 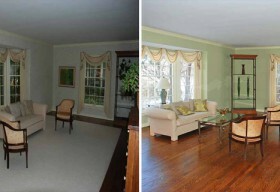 Free Home Staging: We can’t say enough about Chris and Julie’s ability to identify strengths and weaknesses of our house, and find clever and low cost ways to really present our house and property. 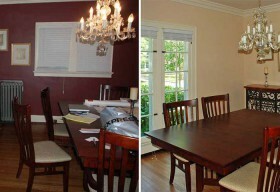 We followed their recommendations, and the house looked so good, it surprised us both. We kept thinking to ourselves, we should have had them come out to our house years ago. We would have enjoyed living in it! Even more impressive was the cost and dedication Chris and Julie demonstrated. 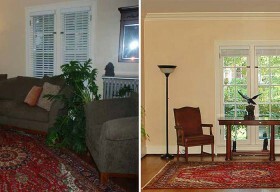 Many Realtors charge the seller for this service which usually costs around $250 just for the home staging report. Not only were Chris and Julie experts at staging, they helped to save us an additional several hundred dollars in staging labor, as well as guiding us through this process, step by step. 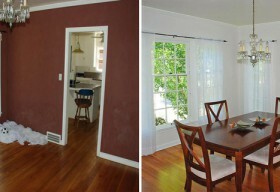 Recommendations for Property Improvements: This really set Chris and Julie apart from other realtors. Given the extremely competitive selling market, we were anxious to learn what advice realtors had for us to best market our home. Other realtors provided minimal to no advice on practical improvements to help protect and maximize our sales price (i.e., painting, etc.). This was NOT the case with Olsen Ziegler! They spent multiple hours offering clear and economical recommendations for improvements, yet we never felt pressured to make even one – the decision was always ours to make. Likewise, Chris and Julie had an extremely knowledgeable appreciation of market trends and ways we could further maximize our marketing by considering additional property improvements. Olsen Ziegler quickly identified several consulting experts, whom provided us with some amazing options we took to further improve our home marketing potential and increase our ‘curb’ appeal. 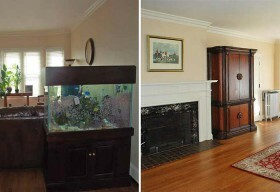 Lower Listing Commission: Despite the extensive consultation and knowledge of staging, Olsen Ziegler was surprisingly economical. 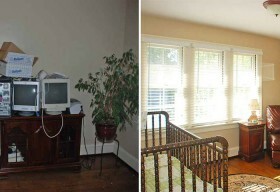 Compared to other national and local realty companies, Olsen Ziegler Realty helped cut costs. We saved in excess of $2,400! We also felt no pressure to sign a contract to list our home with Olsen Ziegler for longer than we were prepared to do. Negotiations & Savings: Chris Olsen negotiated very hard to NOT use certain local title/escrow companies, which saved us around $1,000 in variable title/escrow fees. Insurance premiums were reduced with Chris’ skills for obtaining a re-issue rate in our title insurance premium – another $300-$400 savings. Moreover, there were no administrative transaction fees (or as Chris would call them – junk fees) – saving us an additional $200-$250 versus other companies. Most importantly, Chris really knew how to discuss and negotiate with buyers agents to maximize our home price. Chris and Julie were wonderful! Cost-Effective Contractors: Recommendations for home improvements also came with a list of contractors to help cut costs on larger projects. We had considered several of the projects for years before, but previous estimates made these projects impossible. However, Olsen Ziegler knew of several contractors to work with, and the estimates from these contractors nearly made us faint! 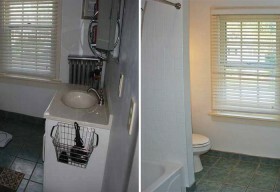 It was considerably less costly than we anticipated, and the contractors had a reputation throughout the area for top quality work. The work on our house was done very professionally, and Chris and Julie were in contact with and worked with us and the contractors to get projects done. The saving was approximately 40% off retail prices. 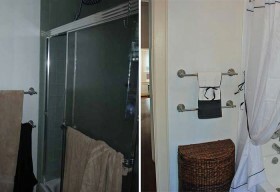 The materials used were name brand, high quality materials and the final product made us wish we weren’t selling our home! Exceptional Project & Time Management: Due to our move out of state, the time frame for renovations and preparations were limited. In 8 short weeks, Olsen Ziegler expeditiously moved from identifying issues, facilitated proposals with contractors, and assisted in the completion of projects (both on time and within budget)! 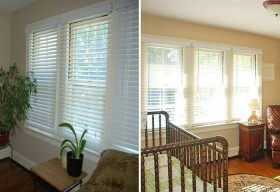 This is exceptional service, particularly for more established and sizeable homes. Exceptional Personalized Customer Service & Local Market Knowledge: Chris and Julie were both professional and personable. They understood the stressors involved in the selling of a house and took this into consideration along every step of the process. Their knowledge of the market was absolutely without parallel! It was clear to us, Olsen Ziegler had more expertise than other realtors whom purported to “know” the market. They always kept us informed of any changes on a timely basis and communications were always seamless. Overall Grade: A+!!!! The Olsen Ziegler approach (both to reducing expenses while maximizing our selling price) saved us at least $50K versus a traditional realtor. This paired with the indeterminate time on the market had we chosen to adopt the traditional approach with another realtor would likely have resulted in our home still being on the market today. In short – we highly and most definitely recommend Olsen Ziegler Realty! We feel we have been spoiled by Chris and Julie, and wish we could take Chris and Julie with us. Regardless if you are buying or selling a home, if you don’t call and talk with Olsen Ziegler Realty, you will short change yourself. 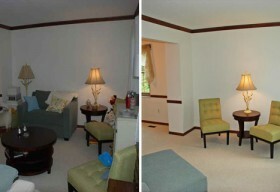 Please view the details of this Cleveland Heights Renovation Case Study and view the transformation.